This weekend we went out to dinner with some friends. The majority of the group felt like breakfast so we hit up Perkins. Cardin had already eaten dinner at home. She is not allowed to eat at restaurants because of the burp/gag/vomit that I’ve so eloquently divulged here before. I brought some crayons and a book and she entertained herself while we ate. I did let her try a sip of Brett’s pop and warned her that it was going to be bubbly. I wish I had taken a video of her reaction. She almost spat the small sip back at me. From then on, Brett was referred to as “Daddy’s Bubbly”. Before we left, our waitress, who smelled like an ashtray, gave Cardin a hybrid cookie. Listen Lady, I’ve never seen such a baking masterpiece. AND IT WAS FROM PERKINS. We’re not even talking fancy here. 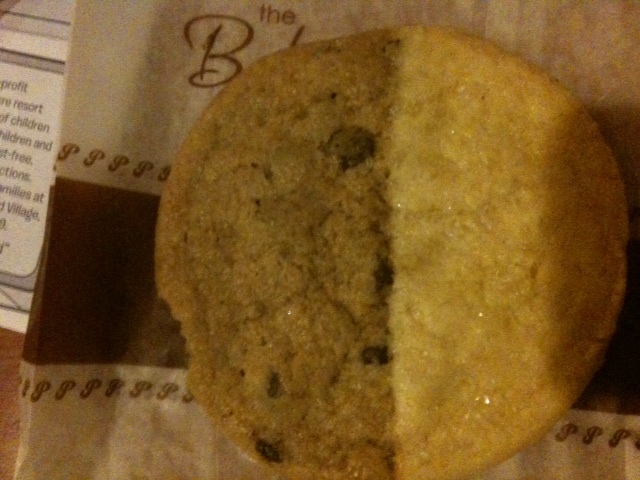 Half chocolate chip and half sugar cookie. GENIUS. The middle was a perfect line of melded cookie. WIN on presentation. I pondered over how one would make such a cookie. Some sort of cookie cutter tool must be used so that an exact portion of both types can be evenly placed on the cookie sheet. I would never be able to accomplish such a feat because, inevitably, one part of the ying would be to runny and would start to tsunami into the yang. I tried to take a bite out of the middle so that I could get both types of cookie, unfortunately the tastes do not work well together. Its comparable to sprinkling raw sugar on chocolate and taking a bite. You may think this is a good idea, but the grit of the raw sugar really overpowers the bittersweet chocolate. FAIL on taste.